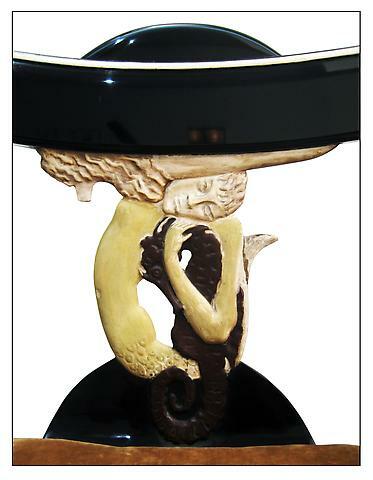 A "Sirène" armchair in black lacquer, the backrest carved and painted to represent a sirène embracing a seahorse, the seat upholstered in copper-colored velvet, the legs with circular detailing on the bottom. Victoria and Albert Museum, London, 1979. Eileen Gray: Designer, Museum of Modern Art, New York, February 7 – April 1, 1980. Eileen Gray, Centre National d’Art et de Culture Georges Pompidou, Paris, February 20 – May 20, 2013, and Irish Museum of Modern Art, Dublin, October 11, 2013 – January 19, 2014. Recorded as "Sirène" in the Jean Désert Gallery daybook of 1923. Peter Adam, Eileen Gray: Architect/Designer, New York: Abrams, 1987, pp. 59 and 383 (catalogue raisonné no. 46). Centre National d’Art et de Culture Georges Pompidou, Eileen Gray exhibition catalogue, text by Cloé Pitiot and others, Paris, 2013, pp. 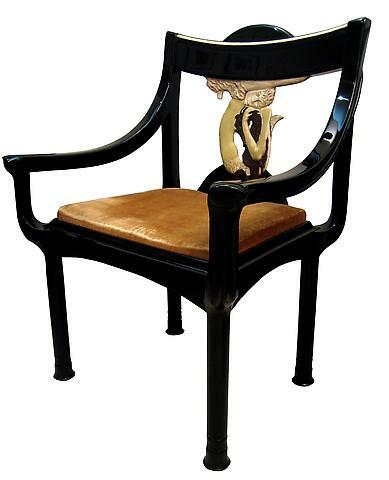 31 and 147 (this chair illustrated). Centre National d’Art et de Culture Georges Pompidou, Eileen Gray: The Exhibition exhibition catalogue, text by Cloé Pitiot and others, Paris, 2013, p. 17 (this chair illustrated). Philippe Garner, Eileen Gray: Designer and Architect, London: Taschen, 1993, pp. 96-97.